Full disclosure: I did not like Room. I did not like Room so much that I didn’t even finish it. I understand what Donoghue was trying to do with Room, I get that it was amazing that she was able the channel the voice of a 5 year old who knows nothing about the real world. But – it drove me nuts. I couldn’t stand reading the story told from the 5 year olds perspective. Everyone else I know loved it though – so maybe I am just totally wrong here – but it was literally one of the worst books I attempted to read last year. HOWEVER! I have looked over the rest of Donoghue’s bibliography and, other than Room, her books certainly appeal to me; based on their blurbs anyway. I first noticed Frog Music at Chapters one day by its bright and fun cover, upon closer inspection the synopsis sounded pretty cool so I added it to my list. 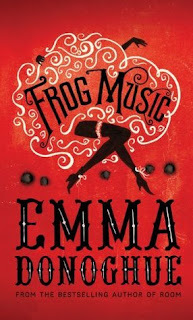 Luckily (or usually annoyingly) my list is hundreds of books long and I found myself kind of avoiding Frog Music. It’s been on display in the library forever, but I was still nervous about picking it up, thinking about how much I hated Room. Well. The other night, while volunteering at the library, I didn’t have time to look through the books, so I grabbed Frog Music off the shelf and crossed my fingers. Jenny has a way of getting inside Blanche, she questions everything, she doesn’t stop when a story seems painful, or if it’s obvious that people don’t want to talk about it. However, she never reveals anything about herself. Blanche knows nothing about her, which becomes blatantly obvious, much to Blanche’s chagrin, after Jenny is murdered (don’t worry, this happens super early in the book – I am not giving anything away!) Blanche is certain that she knows the killer, and that she was the intended target. But in trying to figure it all out, she begins to wonder if maybe she should have gotten to know Jenny better, and if maybe it wasn’t about her at all. I didn’t actually realize before I started reading (although it says it on the front flap!) but this story is actually based on a real life story. I must say that so far I am enjoying it, although I definitely have some issues. Donoghue has painted a realistic portrait of the place and times; (well as far as I know…. Which I mean, I know nothing, but it feels good to me!) she has engaged all of my senses with the book, she talks about the smells and the sounds, the characters are always singing. The City (as it’s referred by his inhabitants) becomes one of the characters. The big problem that I have with the book so far is Blanche, which goes back to my problem with weak characters. Blanche is devoted, completely and utterly devoted to Arthur; she dances and prostitutes herself out to keep Arthur and Ernest in money for their bohemian lifestyle. Meanwhile they do nothing except gamble and sleep with other woman and spend her money. Blanche literally does everything Arthur wants her too, including sleeping with Ernest – which seems to be mostly Ernest trying to get physically close to Arthur. Arthur and Ernest have a very strange relationship; it bounces between brotherly, parental and at times, dominant. Either way, Ernest is also totally devoted to Arthur, and I think that Arthur plays Blanche and Ernest off of each other. They both vie to be the most important one in his life. It bothers me that Blanche lets Arthur walk all over her, though I know those are the times. At the same time, she does notice that things are off. She hides money from Arthur and has also hidden the deed to the house, as it is in her name. In fact, the deed is hidden behind a painting that makes Blanche a little uncomfortable, but is one of Arthur’s favourites – ‘a strange picnic in which a naked woman sits on the grass between two black-jacketed dandies”. My only other small issue is that since Blanche is from Paris, she uses a lot of French throughout the story. It’s not a huge issue for me, I know what most of it means, but I find it distracting when I don’t. Donoghue has put a glossary at the back of the book, which is great – but it distracts the flow of the story when you have to flip to the back. I’ve also noticed that sometimes she translates in the next paragraph, which I think is definitely the way to do it when using another language. I wonder what other people think about this, if it bothers them or adds to the flavour of the story? I am looking forward to finishing the book. There are still a lot of unanswered questions – to the point that I really have no concrete guesses about what’s going to happen. Because the story is told in alternating time lines, there are still things about the lead up to Blanche and Jenny running away that I don’t know. From what I know so far, there really has not been any sort of real reason for Arthur to have lost it as he did. The big problem right now is Blanche’s attempt to be a good mother – Arthur cannot really handle that Blanche’s attention has been diverted from him “Her man and her child. How can Blanche weigh them against each other, and why should she have to?” But there has to be more to it than that? I also need to know more about Jenny, which I am assuming that we must get – there is just too much built up about her mysterious past for it to not have any connection whatsoever to the murder. Although apparently in real life the murder was never solved, so maybe the book will end on a cliffhanger… which would be pretty awful... so I really hope that doesn’t happen. The book is at a pretty good place right now – it could end up being great, but depending on how various things turn out... this may not get as high of a rating as I am anticipating. Look at you back at teasing in your new place... still doing a great job!